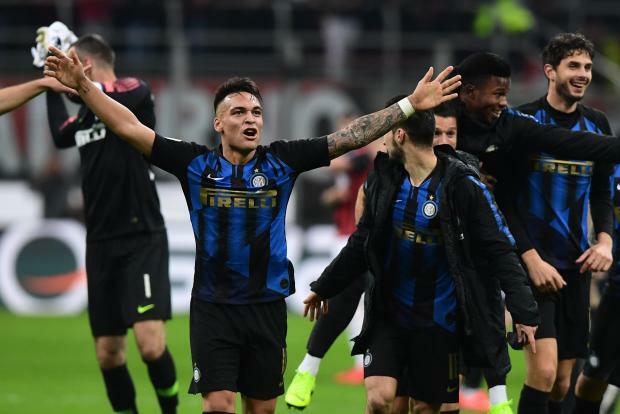 Lautaro Martinez celebrates Inter's victory in the derby against Milan. Inter survived a late scare to hold on to a thrilling 3-2 victory over fierce rivals Milan, leapfrogging their neighbours in the Serie A in the process. Matias Vecino broke the deadlock after just three minutes to give Inter the perfect start at the San Siro. It was exactly the response under-pressure boss Luciano Spalletti would have demanded following Thursday's humiliating Europa League exit to Eintracht Frankfurt. Inter did make their dominance count in the 51st-minute when Stefan de Vrij's header doubled the 'away' side's lead, but only five minutes later Tiemoue Bakayoko's first goal for AC Milan - a bullet header against the run of play - gave Gennaro Gattuso's side renewed hope. Inter restored their two-goal advantage in the 67th-minute courtesy of Lautaro Martinez's penalty-kick after Matteo Politano was felled by Samu Castillejo, but Milan responded almost immediately through Mateo Muascchio's scrappy finish. It was all hands to the pumps for Inter in a tense finale, with Samir Handanovic making a fine save with his shoulder to deny Castillejo's back-post header while Danilo D'Ambrosio made a goal-line clearance, as Spalleti's side recorded the three points that takes them third, two ahead of the Rossoneri.